The Telegraph have an excellent story out today on the Gazprom-Germany-EU shenanigans. It is well worth reading and here is a link to the full story on a non-paywall site. I won't rehearse the whole article because it is very clear. The Germans have been happy to stiff Eastern Europe in complicity with the EU. Now that the whole story is out (which must be some miracle for the EU and I feel for the team who pressed publish on this), the EU are going to have to bury it or else end up with 30% income sanctions on Gazprom and State Aid charges against Germany. The piece to add to it is some people context. For a long time Germany has been well in with Gazprom. This has been arranged by Gerhard Schroder, the ex-Chancellor, who has long been in Putin's arc and is indeed now Chairman of Rosneft (replacing Putin late last year, natch). 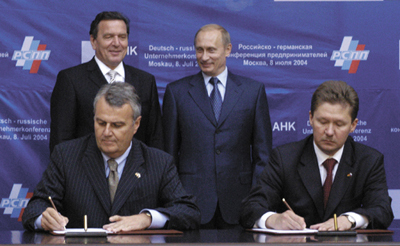 The picture here is from 2005, working closely with all the worst of the Putin Gang. He is indeed a founder member really and today is in the inner cabal, always defending Putin. Angela Merkel has called him out once, saying she does not approve of what he is doing. But the reality is that he has done these sweetheart deals for Germany who look to have gladly lapped them up. Of course, readers here will know of the crazy "EnergieWende" policies in Germany which have left the Country desperate for Russian (low-carbon) gas. As much as there is loathing in the UK for Tony Blair, he has not actually represented state actors that have hostile intentions. Yes he joined a few Bank boards - but even here Schroder has managed to be an Managing Director of Rothschilds to match. It is quite incredible really what has happened politically. Of course, there are real world impacts in addition to the economic splintering of the EU that this has been creating, see just today where Germany refuse to join with US/France/UK in considering what action to take against Syria and their Russian supporters. Whilst there are plenty of solid reasons to avoid getting involved in Syria, the German-Russian gas relationship will always now allow for a lack of credibility to German political positions when we know how compromised they are with their Russian engagements. If Germany is getting into bed with Russia then history suggests that France will try to get in bed with Britain. Frexit? Anyway, we should spurn an alliance that might drag us into silly bloody wars. The money spent on Trident and GCHQ is what would allow us such initiative. And there are the EU telling the UK that there can be no separate deals within Brexit and everything has to be agreed through Brussels. dearieme, as for the French.they can do one. Could be a Really Big Story. More on this when I get back in a day or so. What gets me is "The Nazis did it." Well actually, the Germans did it. Now I don't for one minute expect Germans to have to atone forever but when "the ENGLISH !" are hammered at every single opportunity I don't get it. How are the Germans given such an easy ride - especially by the BBC ??? "Germans get a richer at Poland's expense by doing dodgy deals with Russia" is not really a headline in the UK, we dont really care. Core brexiters will see their views confirmed. I am sure the french have done and will do worse. Ireland's going to be in some bother once the EU finally tanks. "Gerhard Schroder, the ex-Chancellor, who has long been in Putin's arc"
For which read "is not actively hostile to Russia as a good European citizen should be*". * see EU Directive 1213/98 of 2012, not publicly released until last week due to an administrative error. What do you mean, "who voted on it?" Are you a Russian troll?